This Time of Year - January helps you capture the daily happenings of the first month of the year. January is a time we look forward and plan for the new year. It is a time we make resolutions. It is a time we deal with post-holiday blues and get back to a normal routine. This kit is perfect for all of the above and so much more. Super versatile with airy and neutral colors, this is a kit that you'll reach for again and again during the year as you document your day-to-day moments. and 77 elements. 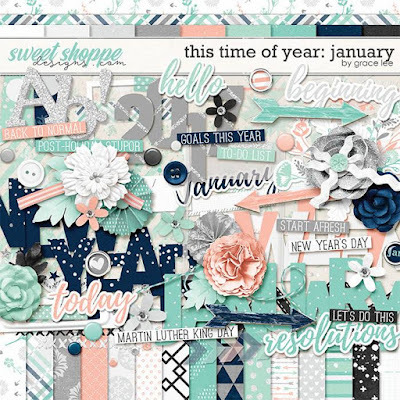 The elements included are: 3 arrows, 1 book plate, 2 bows, 3 brads, 3 buttons, 1 chevron, 8 enamel dots, 1 floral stamp, 1 floral sticker, 12 flowers, 2 foliage, 2 frames, 3 labels and 3 paint, 2 ribbons, 1 ric arc, 2 scatters, 2 snowflakes, 2 stitching, 1 string, 2 tabs, 3 washi tape, 4 titles, and 13 word art.